Environmental Defence, Ontario Nature and Friends of the Rouge Watershed jointly presented the letter to former Ontario Premier Dalton McGuinty in December 2012 summarizing what the groups thought were important conditions for the transfer of Rouge Park land to the Federal Government. Letter to premier on Rouge National Park and Provincial land transfer (Dec 13 2012). 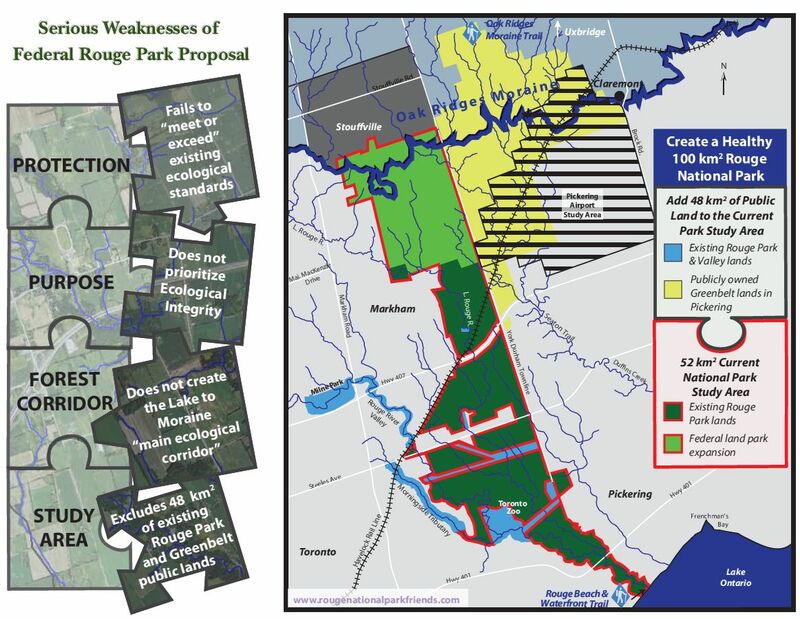 In November 2012, City of Toronto councillors supported an official plan amendment with respect to the Rouge National Urban Park that includes a call to include all of the 100 square kilometres of public land within the Rouge and Duffins Creek watersheds. The World Wildlife Fund (WWF) supports the concept of a 100-square-kilometre Rouge National Park in this September 2012 letter to the federal minister of the environment, Peter Kent. Great Lakes United (GLU) supports the concept of a 100 square kilometre Rouge National Park in this October 2012 letter to Prime Minister Stephen Harper. The letter also calls for forest and wetland restoration and implementation of existing watershed and subwatershed plans. GLU comments regarding Rouge National Park (Oct 10, 2012).